Thanks for the tip Christina. I checked it out and it has been added to my wedding planning bookmarks! The photography they use is great and their guest management system seems really professional. What a great option! I want to second Christina's suggestion - I've used pingg before for birthday parties and it really is awesome. Plus, you can upload your own images! 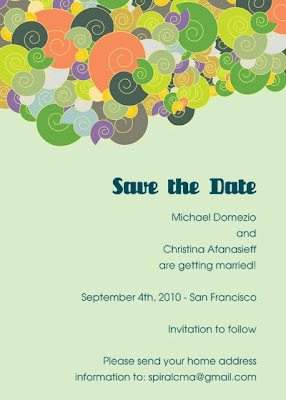 10 years ago I planned a 250 guest wedding for $2000, its doable, and it looks like you are on the right track. Skip the bric a brac and focus on the event being fun. Would have liked to keep the wedding a bit smaller than it was (as my family wasn't attending - except my folks, grandparents and sister - no aunts, unlces or cousins could make it), but DH's family is large and primarily lived in the area we did so that was half my guest list right there.